When an airplane crashes, expert investigators probe the cause. Their analysis can lead to changes in aircraft design, flight procedures, and regulations in hopes of reducing the likelihood of a crash in the future. The growth of knowledge in the airline industry has been extremely productive, with the probability of a fatal crash plummeting. The natural tendency is for economists (and even normal people) to presume that similar analytical techniques can be applied to financial crashes. After all, economists presumably know more than we did in the past. We have ever more data and ever more sophisticated techniques for analyzing those data. Yet there is no evidence that financial market regulation is more effective than in the past; if anything, the opposite appears to be the case. That discouraging record, however, does not seem to hinder an outpouring of ideas to make our financial system more secure. It is obvious, for example, that excessive leverage played a role in the vulnerability of the firms that collapsed in 2008, with the natural response being to increase capital requirements. The incentives of management on Wall Street, however, appear to be out of line with the interests of both investors and taxpayers, leading to suggestions for caps on executive compensation or changes in the mix between cash and other forms of compensation. Kenneth Feinberg, the Obama administration pay czar, has, for instance, limited take-home pay for executives at firms receiving government assistance, offsetting the reduction with increases in stock that would not be accessible for two to four years. The hope is to encourage the growth of long-term investing instead of riskier short-term bets. Despite the spectacular failure of Fannie Mae and Freddie Mac, some economists insist that Fannie and Freddie need to be kept in place but somehow made safer. This optimistic advocacy—which assumes that Fannie and Freddie are like airplanes that need better landing gear—overlooks the fact that from 1992 to 2008 Fannie and Freddie had a regulator, the Office of Federal Housing Enterprises Oversight, which failed to stop the meltdown that has cost U.S. taxpayers about $100 billion and counting. Somehow, though, this time will be different. I am not optimistic about reforming the government-sponsored enterprises or the system of regulation and supervision of Wall Street. Our financial system is not like an airplane but rather is complex in a way that makes even an airplane look simple. It is an emergent system in which outcomes emerge from dynamic interactions among investors, regulators, and politicians. Economists have an imperfect understanding of those interactions. Because of the feedback loops among the different actors in the system, we also have an imperfect understanding of how changing one piece of the system will affect the rest of the system. More-reliable landing gear makes an airplane safer, but reducing risk or changing incentives in one part of the financial system can cause changes elsewhere that reduce stability. Recognizing the meagerness of our understanding is a good starting place for what should be a humble approach to financial reform. Economists presumably know more than we did in the past. Yet there is no evidence to suggest that financial-market regulation is more effective than in the past. For example, advocating “better” supervision, “more vigorous” regulation, or even something as specific as larger capital cushions ignores the empirical evidence that regulators and politicians (for either venal or human reasons) seem unable to maintain these restrictions in the face of pressure from participants. Even detailed, specific plans are unlikely to succeed because of the feedback loops present in all emergent systems. Friedrich von Hayek said that “the curious task of economics is to demonstrate to men how little they really know about what they imagine they can design.” There are few better illustrations of this than attempts to engineer a financial system that preserves the incentives to take risks and at the same time preserves prudence. We imagine that we can design a better financial system; perhaps it is time to concede that such a top-down enterprise is inherently flawed. Economists who treat the financial system like an airplane ignore the symbiotic dance between politicians on the one hand and financial institutions on the other. The revolving doors between Fannie Mae and government, and between Goldman Sachs and government, are only the most obvious indicators that something is wrong. A martian impartially observing the U.S. financial system would conclude that it is run to benefit the executives and protégés of Goldman Sachs. This is not a good thing even if it is not true; if it is true, then any meaningful financial reform must start with finding ways to break that symbiosis. Fannie and Freddie already had their own regulator, the Office of Federal Housing Enterprises Oversight, which failed to stop the meltdown that has cost the U.S. taxpayer $100 billion and counting. The government, because of that symbiosis and other political incentives, played a significant role in reducing the stability of the system and perverting the incentives that would naturally have emerged. The rescues of the past twenty-five years—Continental Illinois, the Fed-orchestrated intervention to prevent the sudden collapse of Long Term Capital Management, the implicit guarantee of Fannie and Freddie—reduced the incentive of counterparties, particularly lenders, to restrain the highly leveraged bets that ended up wreaking so much financial havoc. Why didn’t debt issuers restrain Wall Street’s growing appetite for risk? Partly because they anticipated the possibility of government rescue, especially as their lending made them increasingly entangled with one another. The importance of moral hazard, described presciently in 2004 by Gary Stern and Ron Feldman, is often treated with skepticism because of what seem to be restraints on recklessness imposed by equity holders. After all, the skeptics point out, Jimmy Cayne, CEO of Bear Stearns, and Richard Fuld, CEO of Lehman Brothers, each lost $1 billion from the collapse of their companies’ stocks from earlier highs. Surely this dilutes the moral-hazard problem. But Cayne and Fuld could not access those paper profits at will. More important, each man is worth roughly $500 million, wealth accumulated through cash compensation and the occasional judicious sale of their companies’ stock in advance of the crash. When people spend their own money, they spend it more carefully. Cayne and Fuld doubled down with other people’s money; they were more prudent with their own. Reasonable people can debate the role that past rescues played in the excessive risk taking that destroyed much of Wall Street. But the subsequent rescues of Bear Stearns, Merrill, Citigroup, Fannie and Freddie, and AIG have certainly set significant expectations for the future. Even otherwise optimistic economists understand that this prescription is unlikely to succeed, given the incentives of politicians and policy makers to avoid short-run damage in favor of meltdowns that come to pass in the long run (where they may not be dead but are at least out of office).Yet unless the implicit policy of bailing out the creditors of large financial institutions is rescinded, there will be few checks on the excessive leverage and the imprudence that inevitably follows when people are allowed to gamble with other people’s money. Top-down repairs will fail. We must find ways to let bottom-up solutions emerge. • Don’t try to re-create the old system while making it “better.” There is a natural wariness about securitization right now. That is good. Let it blossom. There is a natural wariness about zero-down mortgages. That is good. Let it blossom. • Recognize that having every American own a home is not the American Dream but the dream of the National Association of Home Builders and the National Association of Realtors. Any government programs to increase home ownership should be funded from current tax dollars, where the costs are visible. Get rid of mandates such as the Community Reinvestment Act, as well as Fannie and Freddie. • Be aware that the Federal Reserve is part of the problem and may not be part of the solution. The Fed created the artificially low interest rates that helped inflate the housing bubble. It then raised interest rates too quickly, with disastrous effects for the adjustable-rate mortgages encouraged by the low-interest-rate policy. Monetary policy should not be left to any self-proclaimed or publicly anointed maestro. Following an automatic rule for money growth or the Taylor rule would have avoided much of the pain. Somebody needs to hold the Fed accountable for funding exuberance. Moreover, the Fed has played a major role in exacerbating the moral-hazard problem. It is not good for our democracy to let an agency as unaccountable as the Fed acquire even more power and use it in ad hoc ways. • Capitalism is a profit-and-loss system. The profits encourage risk taking; the losses encourage prudence. These natural feedback loops have been distorted by the rescues of the past and present. During the economic crisis, average Americans have sent hundreds of billions of dollars to some of the richest people in human history. The better the citizenry understands this, the likelier that political incentives will change. We need to take the cronies out of crony capitalism. That will not be easy, but economists should not make it more difficult. Economists’ near-universal praise for the actions of Ben Bernanke, Henry Paulson, and Timothy Geithner and the near-universal condemnation of the Lehman Brothers collapse reduce the likelihood that policy makers will act differently in the future. Economists should stop being the enablers of obscene transfers of wealth. • Policy makers who make creditors and lenders whole should be excoriated and called to account rather than praised and honored. Zero cents on the dollar for bankrupt bets made by lenders and creditors would be ideal, but it is unlikely to be a credible promise. So let’s start more modestly, with a ceiling of 50 cents on the dollar for creditors and lenders when the institutions they fund become insolvent. Even this may be too hard for politicians to stomach. But economists, at least, should preach the virtues of letting creditors lose money when they finance imprudent risks. We also need to take the cronies out of crony capitalism. Economists should stop being the enablers of obscene transfers of wealth. We are what we repeatedly do, not what we say. 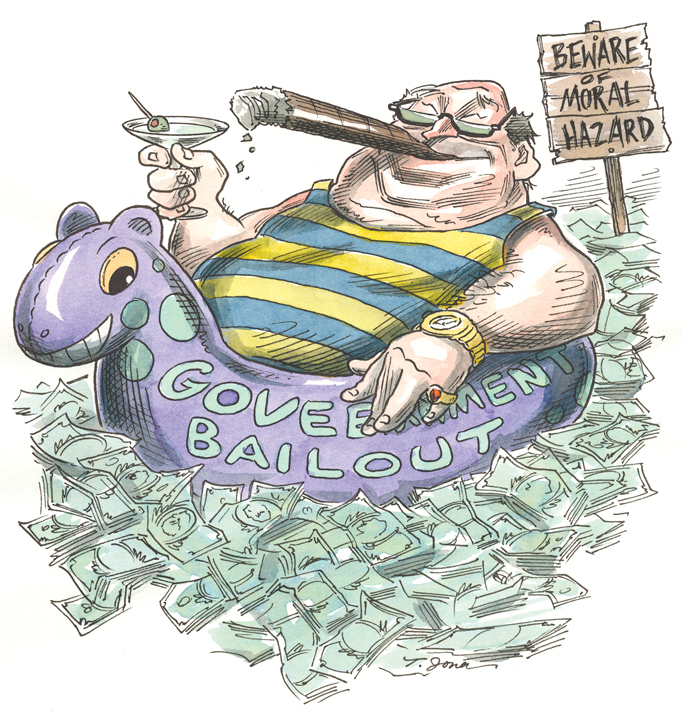 What we do as a body politic is rescue rich people from the consequences of their decisions. That is bad for democracy and bad for capitalism. Until we fix that, we as citizens are tossing a coin: heads means Wall Street executives win a ridiculously enormous amount, and tails means they win only a ridiculous amount, paid for by the rest of us. Until we fix that, little else matters. This essay appeared in the November 2009 issue of the Economists’ Voice (www.bepress.com/ev). Copyright © 2010 by the Berkeley Electronic Press. New from the Hoover Press is Reacting to the Spending Spree: Policy Changes We Can Afford, edited by Terry L. Anderson and Richard Sousa. To order, call 800.935.2882 or visit www.hooverpress.org.